I was advised of a recent paper that studies the impact of the Atlantic Multidecadal Oscillation on global surface temperatures since 1900. (Thanks, Anthony.) The paper is Chylek et al. (2014) The Atlantic Multidecadal Oscillation as a dominant factor of oceanic influence on climate. The paper is flawed in some respects, but many skeptics will agree with it because it questions the value of climate model projections. A multiple linear regression analysis of global annual mean near-surface air temperature (1900–2012) using the known radiative forcing and the El Niño–Southern Oscillation index as explanatory variables account for 89% of the observed temperature variance. When the Atlantic Multidecadal Oscillation (AMO) index is added to the set of explanatory variables, the fraction of accounted for temperature variance increases to 94%. The anthropogenic effects account for about two thirds of the post-1975 global warming with one third being due to the positive phase of the AMO. In comparison, the Coupled Models Intercomparison Project Phase 5 (CMIP5) ensemble mean accounts for 87% of the observed global mean temperature variance. Some of the CMIP5 models mimic the AMO-like oscillation by a strong aerosol effect. These models simulate the twentieth century AMO-like cycle with correct timing in each individual simulation. An inverse structural analysis suggests that these models generally overestimate the greenhouse gases-induced warming, which is then compensated by an overestimate of anthropogenic aerosol cooling. One flaw is easy to spot. Did you see it? We’ll discuss it later in the post. A multiple linear regression model that uses the set of explanatory variables composed of radiative forcing due to anthropogenic greenhouse gases and aerosols, solar variability, volcanic eruptions, and ENSO accounts for 89 ± 1% of the global annual mean temperature variance. When AMO is added to the set of explanatory variables, the fraction of explained temperature variance increases to 94%. Just two explanatory variables (GHG and AMO) still account for 93% of the temperature variance. The improvement of the regression model by including the AMO is highly statistically significant (p<0.01). For comparison, the CMIP5 ensemble mean of all simulations accounts for 87% of the observed temperature variance. Our analysis suggests that about two thirds of the late twentieth century warming has been due to anthropogenic influences and about one third due to the AMO. This is a robust result independent of the parameterization of the anthropogenic aerosol radiative forcing used or of the considered regression model, as long as the AMO is among the explanatory variables. An inverse structural analysis shows that all considered climate models (GFDL-CM3, HadGEM-ES, CCSM4, CanESM2, and GISS-E2) overestimate GHG warming that is then compensated by an overestimated aerosol cooling. The overestimates are especially large in models with an indirect aerosol effect. In these models a strong aerosol effect generates the AMO-like 20th century temperature variability. The apparent agreement with the observed temperature variability is achieved by two compensating errors: overestimation of GHG warming and aerosol cooling. This raises a question of reliability of these models’ projections of future global temperature. The inverse structural analysis underscores the significance of the AMO-like oscillation and therefore the need to establish its origin and to better simulate it in future climate models. Let’s look at the AMO before discussing the obvious flaws in the paper. 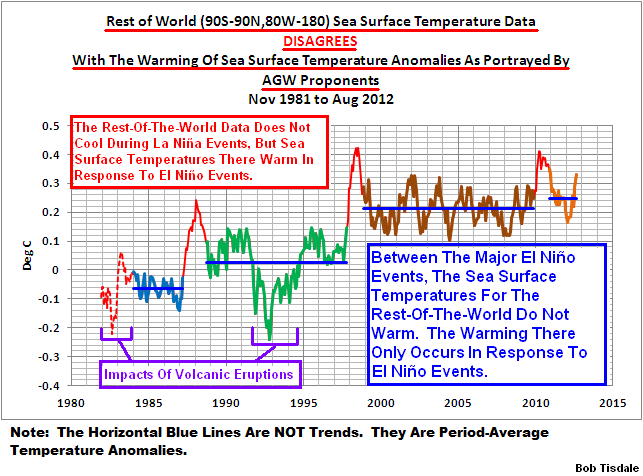 DOES THE AMO CONTRIBUTE ABOUT ONE-THIRD TO LATE 20th CENTURY WARMING? For this part of the discussion we’ll look at global and North Atlantic sea surface temperature anomalies during the recent warming period (Figure 1). 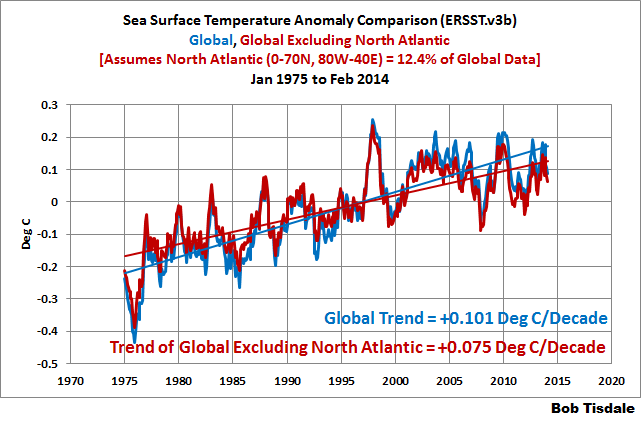 Then remove North Atlantic sea surface temperature anomalies from the global data (Figure 2). Chylek et al. (2014) used GISS Land-Ocean Temperature Index (LOTI) data as their global surface temperature dataset. GISS now includes NOAA’s ERSST.v3b sea surface temperature data for the ocean portion, so we’ll use that sea surface temperature dataset for consistency. And we’ll start the recent warming period in 1975, to also be consistent with Chylek et al. (2014). 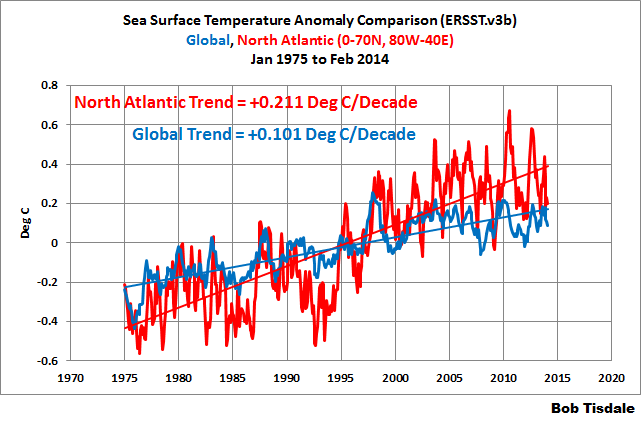 Figure 1 compares global and North Atlantic sea surface temperature anomalies, from January 1975 to February 2014. The surface of the North Atlantic more than doubled the warming rate of the surface of the global oceans. The North Atlantic and the Baltic and Mediterranean Seas represent about 12.4% of the surface of the global oceans. See the table in the NOAA NGDC (National Geophysical Data Center) webpage here. (That’s a great reference, BTW. You may want to add it to your favorites.) To determine the sea surface temperatures of the global oceans excluding the North Atlantic for Figure 2, the North Atlantic data was weighted by 12.4% and subtracted from the global data. As shown, the global sea surface temperature data have a warming rate since 1975 that’s about 33% higher than the warming rate of the global data excluding the North Atlantic. These basic results are in line with the findings of Chylek et al (2014)…if we assume that the global land surface air temperatures proportionally amplify the global and North Atlantic sea surface temperatures. But that’s unlikely since about 68% of continental land surfaces are in the Northern Hemisphere. It, therefore, seems likely that Chylek et al (2014) have underestimated the contribution of the AMO to the warming since 1975. In the post Multidecadal Variations and Sea Surface Temperature Reconstructions, we showed that the sea surface temperatures of the North Pacific also have multidecadal variations, and that they vary in and out of synch with the sea surface temperatures of the North Atlantic. See Figure 3. 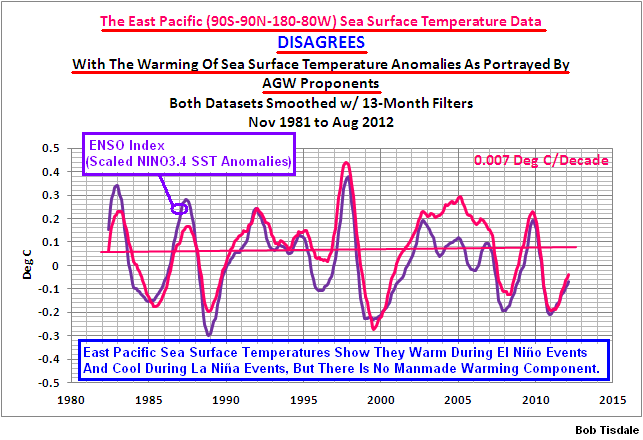 Note: the data illustrated for the North Pacific do not represent the PDO (Pacific Decadal Oscillation) data. As a result, the sea surface temperatures of the Northern Hemisphere have very clear multidecadal variations…that the climate models stored in the CMIP5 archive, not too surprisingly, are unable to simulate. See Figure 4, which is Figure 15 from the post An Odd Mix of Reality and Misinformation from the Climate Science Community on England et al. (2014). The upswing since the 1970s in the multidecadal variations of the North Pacific sea surface temperatures also would have contributed to the warming. COMMENTS ON THE DATASETS USED BY CHYLEK ET AL. As noted earlier, Chylek et al. (2014) use GISS Land-Ocean Temperature Index (LOTI) data for their study. So one would think they would use subsets of that dataset for their ENSO and AMO indices. If that’s what you assumed, your assumption would have been wrong. The annual average ENSO index is obtained by averaging monthly data from http://jisao.washington.edu/data/cti, and the Atlantic Multidecadal Oscillation (AMO) index is an annual average of smoothed monthly values provided by the NOAA. A detailed description on how the AMO is calculated can be found at the NOAA website http://www.esrl.noaa.gov/psd/data/timeseries/AMO/. Let’s start with their chosen ENSO index. It’s an unusual dataset, at best. It’s the Cold Tongue Index from JISAO. It’s based on the ICOADS sea surface temperature database, not a reconstruction, and the ICOADS data for the Cold Tongue Region has been adjusted in an unusual way to account for the Folland and Parker (1995) findings (the bucket corrections). The JISAO Cold Tongue Index is not based on the sea surface temperature dataset employed by GISS for their Land-Ocean Temperature Index (LOTI) data. 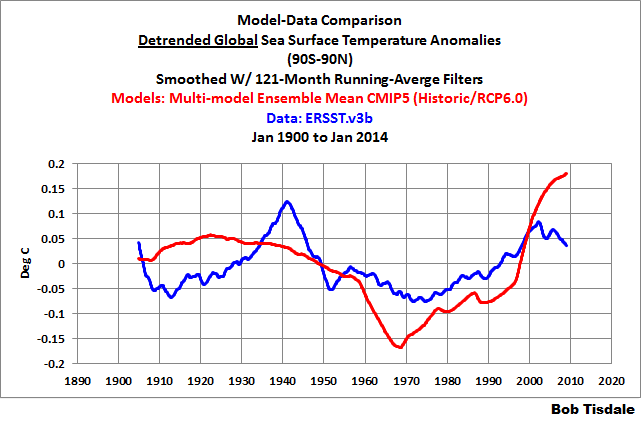 As a reminder, the sea surface temperature dataset now used by GISS is NOAA’s ERSST.v3b. The JISAO Cold Tongue Index uses the sea surface temperature anomalies of the Cold Tongue Region (6S-6N, 180-90W), so the data for that region is similar (but not the same as) the more commonly used ENSO index that’s based on the sea surface temperature anomalies of the NINO3.4 region (5S-5N, 170W-120W). The global mean SST anomaly is subtracted from the CTI in order to remove a step jump at the onset of World War II when the composition of the marine observations largely changed from bucket to engine intake measurements (Barnett 1984, Folland and Parker, 1995), and to lessen the secular trend in the time series that has been associated with global warming (Zhang et al. 1997). As a reference, “the secular trend in the time series” of sea surface temperatures for the equatorial Pacific depends on the reconstruction. Since 1900, the ERSST.v3b-based NINO3.4 sea surface temperature anomalies show warming, while the Kaplan data for the region show cooling and the HADISST data basically show no trend at all. See the left-hand graph in Figure 5. 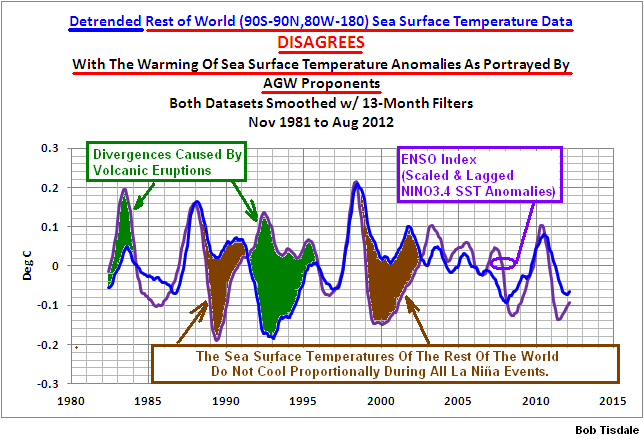 The average of the reconstructions shows no warming of sea surface temperatures for the NINO3.4 region since 1900, as shown in the right-hand cell of Figure 5. 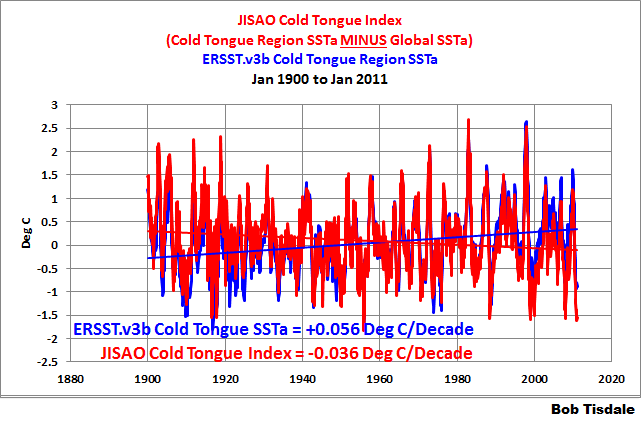 Subtracting the global data from the sea surface temperature data of the cold tongue region, of course, biases the JISAO Cold Tongue Index data warm in the early decades and cool in the later decades, which imposes a long-term negative trend on the JISAO Cold Tongue Index data. On the other hand, as noted above, the ERSST.v3b sea surface temperature data for the Cold Tongue Region shows a positive trend. See Figure 6. Basically, in their regression analysis, Chylek et al. are trying to determine the impact of the sea surface temperatures of the Cold Tongue Region on global surface temperatures, but the JISAO Cold Tongue Index data has been modified by global sea surface temperatures. Bottom line: by using the JISAO Cold Tongue Index instead of the ERSST.v3b-based data for the region, Chylek et al. are creating the need for greenhouse gases to explain more of the warming in their regression analysis. Considering the ENSO index is scaled drastically as a result of the regression analysis, it’s not a major effect, but it would change their results slightly. Chylek et al. 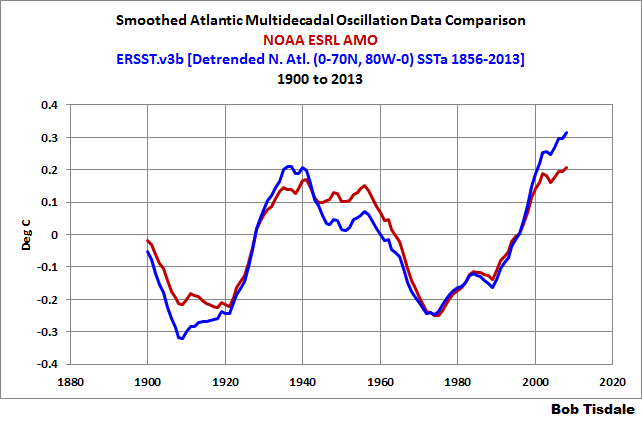 may have used this alternative ENSO index to be conservative in their contribution of the AMO. There is, of course, another problem with including ENSO data in a regression analysis. We’ll discuss that in the next section. 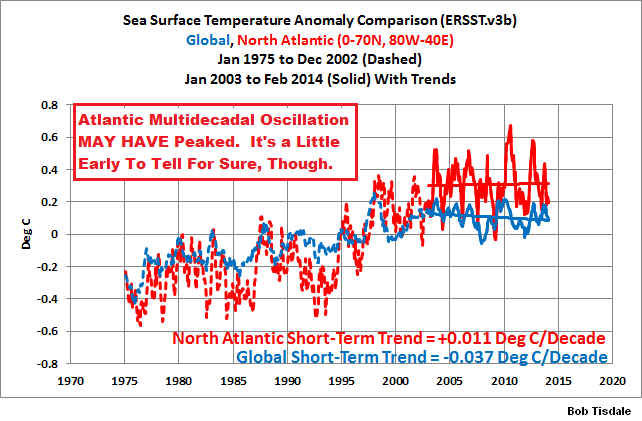 For the Atlantic Multidecadal Oscillation data, Chylek et al. 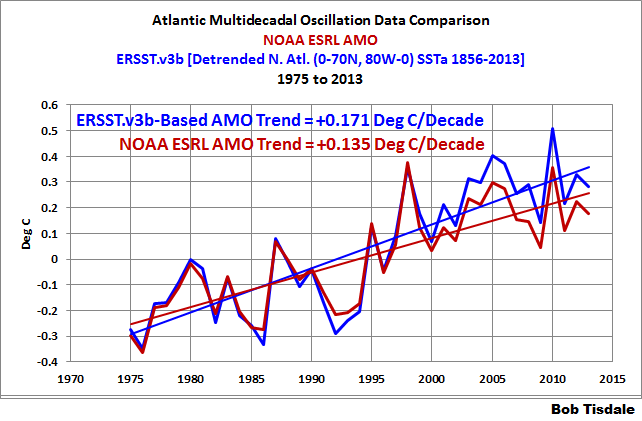 (2014) use the NOAA ESRL Atlantic Multidecadal Oscillation (AMO) data. Curiously, Chylek et al. claim to have used the “annual average of smoothed monthly values”. 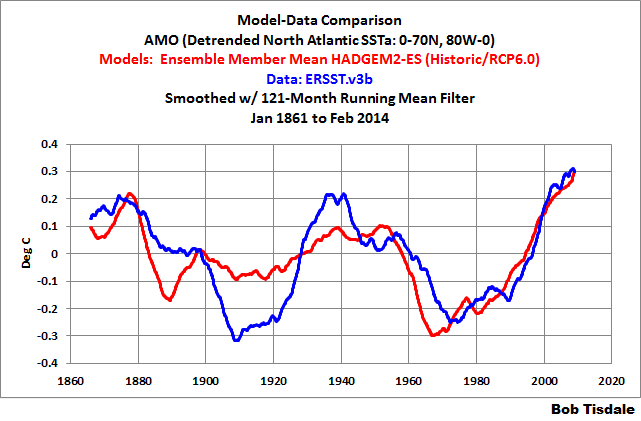 The “smoothed monthly values” of the ESRL AMO data have been smoothed with a 121-month running-mean filter. I suspect Chylek et al. used the smoothed data because there is a strong ENSO component in the “raw” AMO data, and they did not want to duplicate the ENSO signal. Or maybe they were interested only in the multidecadal component of the AMO data and not the annual component. Whatever the reason, using the smoothed data in a regression analysis is odd. The ESRL AMO data is based on the Kaplan sea surface temperature dataset, not the NOAA ERSST.v3b data used in the GISS LOTI data. The Kaplan and ERSST.v3b versions of the North Atlantic data are quite different, and, subsequently, their AMO data are different. See Figure 7. For the ERSST.v3b version of the AMO data, I followed the AMO recipe from the NOAA ESRL, then smoothed the monthly data, and converted it to annual averages. By using the NOAA ESRL AMO data instead of the AMO based on the North Atlantic sea surface temperature data used by GISS, Chylek et al. (2014) underestimated the impact of the AMO on global surface temperatures. Since 1975 the ERSST.v3b-based AMO data (used in the GISS product) have a higher warming rate (about 25% higher) than the AMO data from NOAA ESRL. See Figure 8. Again, this shows that the results of Chylek et al. may be conservative. The fatal flaw in Chylek et al. is their inclusion of an ENSO index in their multiple regression analysis. They’re assuming that an ENSO index represents the processes of El Niño and La Niña events and all of their aftereffects. But, as I’ve stated before, using an ENSO index as a proxy for ENSO—and its aftereffects—is like trying to do the play-by-play of a baseball game from an overhead view of home plate. You’re only seeing one small portion of the processes and aftereffects of ENSO. Over the past 5 years, we’ve discussed in numerous posts that it is impossible to determine the long-term effects of ENSO on global surface temperatures through linear regression analysis. For those new to this topic, the following is a reprint of a portion of the post Rahmstorf et al (2012) Insist on Prolonging a Myth about El Niño and La Niña. In it, I’ve changed “Rahmstof et al. (2013)” to “Chylek et al. (2014)” and changed the illustration numbers, but I have not updated the graphs. I’ve also made a few clarifications and they are bracketed. Chylek et al. (2014) assume the effects of La Niñas on global surface temperatures are [the] proportional to the effects of El Niño events. They are not. Anyone who is capable of reading a graph can see and understand this. But first: For 33% of the surface area of the global oceans, the East Pacific Ocean (90S-90N, 180-80W), it may be possible to remove much of the linear effects of ENSO from the sea surface temperature record, because the East Pacific Ocean mimics the ENSO index (NINO3.4 sea surface temperature anomalies). [That is, the sea surface temperatures of the East Pacific warm and cool proportionally to the ENSO index during El Niño AND La Niña events.] See Figure 9. 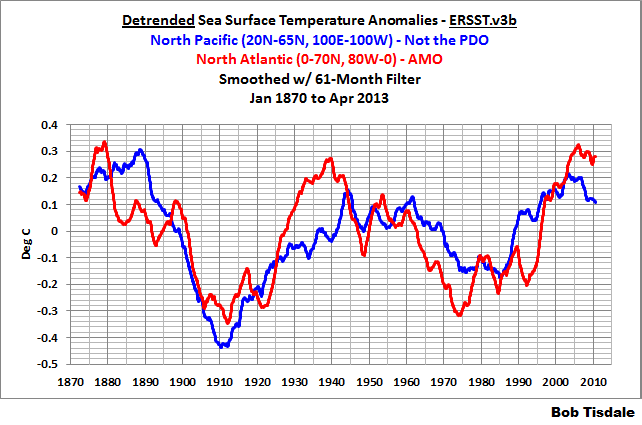 But note how the East Pacific Ocean has not warmed significantly in 30+ years. A linear trend of 0.007 deg C/decade is basically flat. However, for the other 67% of the surface area of the global oceans, the Atlantic, Indian and West Pacific Oceans (90S-90N, 80W-180), which we’ll call the Rest of the World, the sea surface temperature anomalies do not mimic the ENSO index. We can see this by detrending the Rest-of-the-World data. Refer to Figure 10. Note how the Rest-of-the-World sea surface temperature anomalies diverge from the ENSO index during four periods. The two divergences highlighted in green are caused by the volcanic eruptions of El Chichon in 1982 and Mount Pinatubo in 1991. Chylek et al. are likely successful at removing most of the effects of those volcanic eruptions, using an aerosol optical depth dataset. But they have not accounted for and cannot account for the divergences highlighted in brown [by using an ENSO index]. Again, the divergences in Figure 10 shown in brown are those ENSO residuals. They result because the naturally created warm water released from below the surface of the West Pacific Warm Pool by the El Niño events of 1986/87/88 and 1997/98 are not “consumed” by those El Niño events. In other words, there’s warm water left over from those El Niño events and that leftover warm water directly impacts the sea surface temperatures of the East Indian and West Pacific Oceans, preventing them from cooling during the trailing La Niñas. The leftover warm water, tending to initially accumulate in the South Pacific Convergence Zone (SPCZ) and in the Kuroshio-Oyashio Extension (KOE), also counteracts the indirect (teleconnection) impacts of the La Niña events on remote areas, like land surface temperatures and the sea surface temperatures of the North Atlantic. See the detrended sea surface temperature anomalies for the North Atlantic, Figure 11, which show the same ENSO-related divergences even though the North Atlantic data is isolated from the tropical Pacific Ocean and, therefore, not directly impacted by the ENSO events. There’s something blatantly obvious in the graph of the detrended Rest-of-the-World sea surface temperature anomalies (Figure 10): If the Rest-of-the-World data responded proportionally during the 1988/89 and 1998-2001 La Niña events, the Rest-of-the-World data would appear similar to the East Pacific data (Figure 9) and would have no warming trend. Because those divergences exist—that is, because the Rest-of-the-World data does not cool proportionally during those La Niña events—the Rest-of-the-World data acquires a warming trend, as shown in Figure 12. In other words, the warming trend, the appearance of upward shifts, is caused by the failure of the Rest-of-the-World sea surface temperature anomalies to cool proportionally during those La Niña events. For updated versions of East Pacific data in Figure 9 and the Rest-of-the-World data (Atlantic, Indian and West Pacific Oceans) in Figure 12, see the most recent sea surface temperature update here. Now, before you go off half-cocked and think manmade greenhouse gases fuel El Niño events, the ocean heat content data for the tropical Pacific and basic ENSO dynamics contradict that assumption. If this topic is new to you, see the illustrated essay “The Manmade Global Warming Challenge” [42mb] and the post Untruths, Falsehoods, Fabrications, Misrepresentations. The processes that fuel and drive El Niño and La Niña events, and their aftereffects, are discussed in much more detail in my ebook Who Turned on the Heat? – The Unsuspected Global Warming Culprit: El Niño-Southern Oscillation. That book is only available in pdf format and it’s introduced in the post here. It is on sale for US$5.00 here. A strong aerosol effect explains why the AMO-like behavior is reproduced with a correct timing in each individual simulation by these models. This interpretation agrees with Booth et al. who state that the twentieth century Atlantic temperature variability in the HadGEM-ES model is due to an aerosol effect. The findings by Booth et al. were disputed by Zhang et al. (2013) Have Aerosols Caused the Observed Atlantic Multidecadal Variability? Issac Held has an overview of those papers in his post Atlantic multi-decadal variability and aerosols. Figure 13 is a model-data comparison of the HADGEM2-ES simulation of the AMO (using historic and RCP6.0 forcings), along with the ERSST.v3b-based version of the AMO. I used the NOAA ESRL recipe for the calculating AMO, but started the trends of the data and the model ensemble mean in 1861 to accommodate the HADGEM2-ES models. The detrended data and model mean were then smoothed with 121-month running-mean filters. (See the post here for why we look at the model mean.) As illustrated, the ensemble member mean of the HADGEM2-ES does a pretty poor job of capturing the long-term strength and frequency of the ERSST.v3b-based Atlantic Multidecadal Oscillation. Just in case you’re concerned that the UKMO may have relied on the HADSST3 version of the AMO for their tuning, refer to Figure 14. The long-term performance is not much better. And to further illustrate one of the flaws in the claim by Booth et al. that the AMO is a result of aerosol forcings, the NODC vertically averaged temperature data for the depths of 700-2000 meters suggest that part of the AMO may result from changes in Atlantic Meridional Overturning Circulation (AMOC), inasmuch as the data appear to show an exchange of heat between the top 700 meters of the North Atlantic and the depths of 700-2000 meters. See Figure 15. 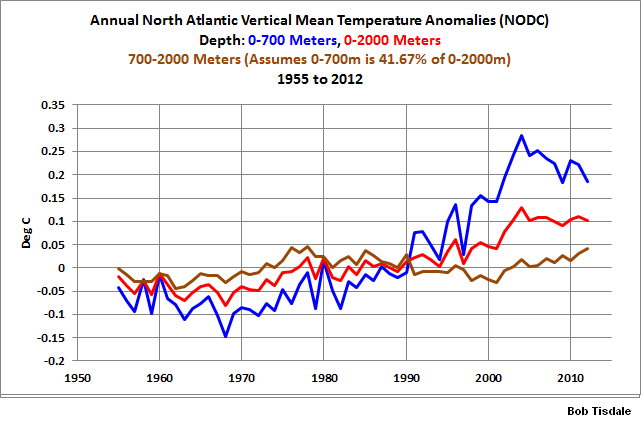 As a reference, Figure 16 compares the NODC’s vertically averaged temperature data for the depths of 0-700 meters and 0-2000 meters for the North Atlantic, along with the calculated data for 700-2000 meters. The logic for using 41.6% for the 0-700 meter data (as its portion of the 0-2000 meter data) is discussed here. 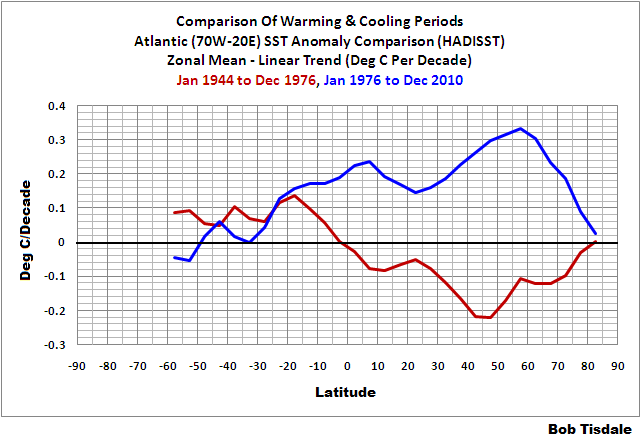 Although the multidecadal variations in the sea surface temperatures of the North Atlantic extend into the tropical South Atlantic (see Figure 17), the Atlantic Multidecadal Oscillation is primarily a Northern Hemisphere phenomenon. It seems odd that Chylek et al. did not present the impact of the AMO on Northern Hemisphere surface temperatures, in addition to its impact on global temperatures. And, I don’t believe Chylek et al. 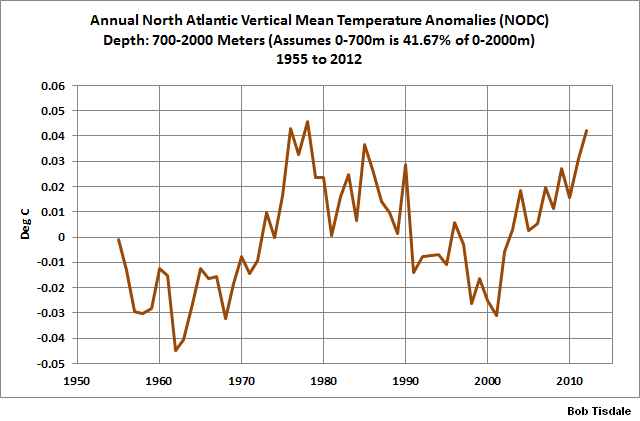 (2014) noted this, but the sea surface temperature data for the North Atlantic indicate the AMO may have peaked(emphasis on the may), though it’s a little early to tell. The sea surface temperature data for the North Atlantic show sea surfaces there have warmed very little over the past 11 years. See Figure 18. Then again, global sea surface temperatures have cooled in that time. I’m sure when you study Chylek et al. (2014) you’ll note other points you might not agree with. I’ve addressed things I noticed. Chylek et al. (2014) has a number of problems. They used ENSO and AMO indices from datasets that are not part of, and are significantly different than, the GISS global land+ocean surface temperature data they used as a reference. Then again, based on their methods, their use of the JISAO Cold Tongue Index data and the NOAA ESRL AMO data likely resulted in conservative estimates of the contribution of the AMO…but are we looking for conservative estimates of natural variability. Ocean heat content data and satellite-era sea surface temperature data indicate that ENSO acts as a chaotic, sunlight-fueled, recharge-discharge oscillator, with El Niño events serving as the discharge phase and La Niña events serving as the recharge and distribution phase…and that ENSO; acting as a naturally occurring, sunlight-fueled process; is capable of raising global sea surface temperatures and tropical Pacific ocean heat content with no apparent influence from manmade greenhouse gases. By including an ENSO index in their multiple regression analysis, Chylek et al. made the assumptions that ENSO is only noise in the global surface temperature record and that ENSO does not contribute to the long-term warming trend. That, of course, is contradicted by data. Data for the graphs in this post are available from the KNMI Climate Explorer. 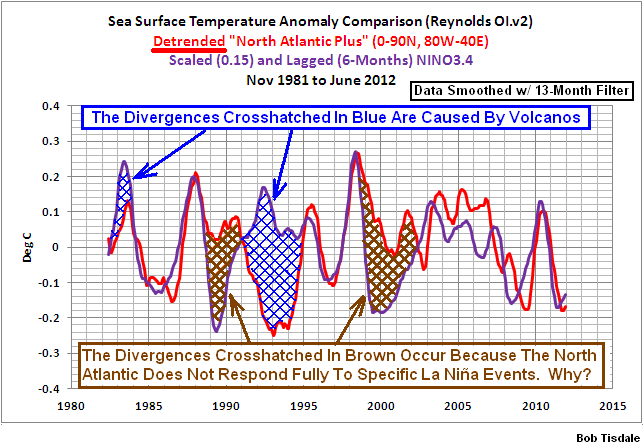 This entry was posted in Atlantic Multidecadal Oscillation, Climate Model Failings, El Nino-La Nina Processes. Bookmark the permalink. Very interesting analysis – thank you! If the AMO really has peaked and is going down again, the next few years will be extremely interesting. Hi Bob, many thanks, not had chance yet to read through but quick question:- North Atlantic 80W-40E in Fig 1 & 2? Thanks, Bob. Very interesting analysis. It shows more interest in the oceanic influences on the global climate, but sadly had to be cooked to show more CO2 importance. Green Sand, with the longitudes of 80W-40E, we also capture the Baltic and Mediterranean seas. Including them does not alter the trend of the North Atlantic data. I just read Willis’ critique. Leif claims the solar forcing is not correct. Now I’m off to look at what Nic Lewis has to say. You have reported on this many times. The community ought to start an e-mail chain-memo of the sort ‘read this and send it to 20 people you know’ – round and round the world for about 6 months. For a PS they could tack on the bit about using smoothed data in regression analysis.